Nikki Giovanni’s lyrical text brings to life an unusual friendship between two great American leaders. Perhaps forbidden, it was a friendship that perservered nonetheless. 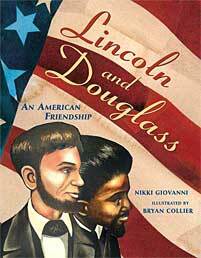 During a unit on the Civil War, or its aftermath, read aloud this book. This is a wonderful text to get students to think about the racial tensions that occurred during that time. Despite the end of the Civil War, there were still two distinct opposing “sides” when it came to race relations. Giovanni lyrically illustrates how two very different men were able to bond over shared ideals and work together for a common goal. Lesson Idea After reading aloud this book, break students into groups of four. Present a question for discussion regarding the friendship between Lincoln and Douglass, the racial inequality of the time, or further research whether Mrs. Lincoln’s sympathies really “did not lie with the men and women of color” (There has been some controversy as to whether this is true or not). Make sure the question has clear pros and cons. If necessary, have students further research the topic to give more background information. Have each group of students complete a discussion web to synthesize their thoughts on the matter. Students must come to a group consensus upon completion of the discussion. Have each group share their consensus with the whole class. After a class discussion, have individual students write a persuasive essay based on the topic.